Frames Pre-Adjusted to Your Face. Free & Accurate PD Measurement. Have you ever wondered why glasses are so expensive at optical stores? 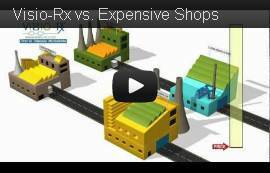 This video portrays the supply chain that leads up to the consumer, and shows you why Visio-Rx can offer you the same quality glasses with an average savings of 82%. Have you ever walked into a store to buy glasses with an excellent promotion, only to walk out having spent much, much more than you originally intended? This video depicts a few scenarios that may occur, along with an explanation as to why you wind up spending much more on your frame and lenses than planned. Why is it that we change our clothes for numerous occasions, but always wear the same glasses? One pair of shoes isn't enough... Neither is one pair of glasses. We believe that owning multiple pairs of glasses shouldn't leave you broke. Go ahead, give us a try! Not all glasses are created equally. 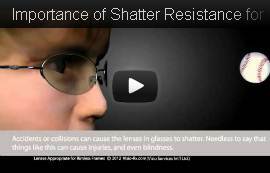 When you need glasses for sports use or for children, it is highly recommended to get glasses that have superb shatter resistance properties. Not all materials have these properties; watch the video to find out more. Progressive lenses, also known as no-line bifocals, are multifocal lenses that don't have the obvious dividing line that bifocals and trifocals have. Progressive lenses are typically used by people over the age of 40, because around that age people notice that they need a little bit of extra power to be able to read more clearly. 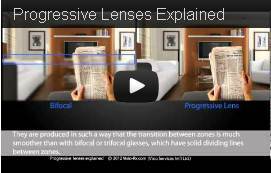 This video provides more details about progressive lenses. Adnuo® Optimo lenses are ideal for people with plus prescriptions. These lenses are tailor-made to your prescription and chosen frame, at an extremely affordable price. Because the lenses are made specifically for you, they will wind up being the thinnest lens possible, eliminating bulging lenses and thick edges. One of the most common questions our customers have about purchasing eyewear online is how can they be sure their glasses will work for them; both in terms of frame fit and, most importantly, vertical lens placement. Lens coatings are important to get the optimal performance and life out of the lenses. Many companies charge top dollar for these coatings, and often the customer is discouraged from applying important protections to their lenses because of the price. Pupillary distance, or PD, is the distance between your pupils when looking straight ahead. This is a necessary measurement for glasses to put the optical center of the lens right in front of your pupils, making the glasses comfortable and natural to wear. Passion and specialism are second nature for us at Visio-Rx. This is not "just" an online optical shop, but rather a team of specialists on an eyewear mission. An almost obsessive focus on enthusiastic service is what drives us; aiming for knowledgeable advice and great glasses - at wonderful prices to boot. 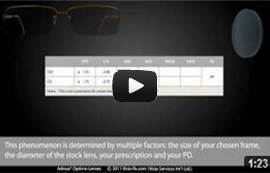 Visio-Rx takes buying eyewear online to an advanced level. Obviously, we want our customers to be satisfied, but rather we`d like for you to be in awe. Looking for new prescription glasses? 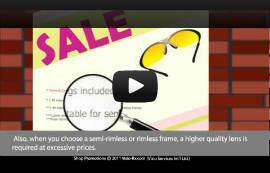 Tired of paying extraordinarily high prices for your eyewear in stores? Yes? Are you looking for a way to save money on your glasses without sacrificing quality? Great, you've come to the right place! Visio-Rx prides itself on offering the latest trends in glasses, along with the lowest prices out there for prescription eyewear. Making the process of buying your glasses online easy is part of our mission, along with offering our customers the tools needed to get a proper fit on their eyeglasses. Visio-Rx.com offers the latest styles for anyone; we have a huge collection of eyeglasses frames! You'll be sure to find the perfect one for you. Whether you're shopping for yourself, your significant other or yourself, Visio Rx has you covered: women's eyeglasses, men's eyewear and children's glasses are all only a hop, skip and a click away. We have lots of information on our website to help you find the perfect sized frame for you before buying your prescription eyewear online. We offer an online PD meter, which accurately measures your pupillary distance for free. Also, a free service called PerfectFit™ gives customers the opportunity to have their lenses placed in their new glasses based on accurate, personal measurements. The prices for all our eyewear include a complete lens coating package, consisting of anti-reflective (anti-glare) treatment, hard coat (anti-scratch), 100% UV protection, and a basic hydrophobic coating. And (perhaps most importantly) when you shop with us, you can get a complete pair of prescription glasses for just a fraction of the cost of what the prescription eyeglasses chain stores charge! Visio-Rx: Revolutionizing the way glasses are bought online. Give us a try, we won't disappoint you!